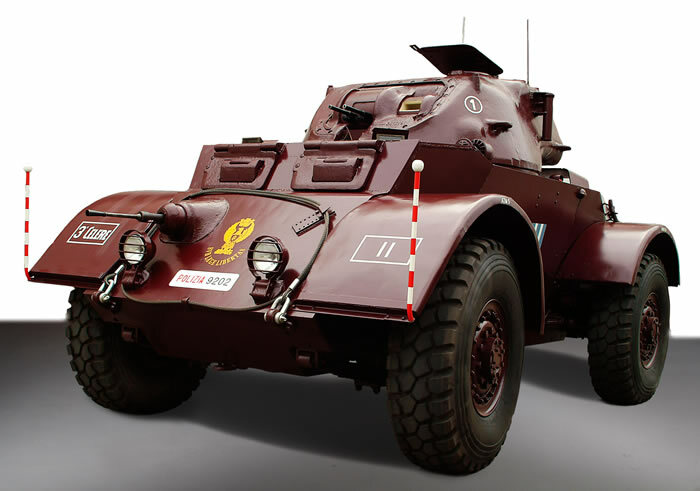 The Italian Police received about 60 Staghound armored cars during the late 40s, which were given to the fast-deployment mobile units (Reparti Celeri). The 37mm gun was substituted with two Breda mod. 38 machine guns (the same MGs mounted on the M13/40 tank), the coaxial MG was eliminated and a Breda mod. 35 replaced the original frontal MG. Painted in a characteristic semi-gloss amaranth color, Staghounds remained in service throughout the 50s and up to the 60s. The Reparti Celeri were some sort of paramilitary units which, during the 50s, were equipped with both Italian old war horses (AB 41, 42 and 43 armored cars, L and M series tanks) and allied equipment (mostly jeeps and Staghounds): they were called upon in every situation of turmoil and riot, hence the Staghound had a prominent role in many unfortunate episodes which took place in one of the most turbulent periods in recent Italian history, such as the massacre in Modena, Jan 9th 1950, when 6 workers on strike where killed. 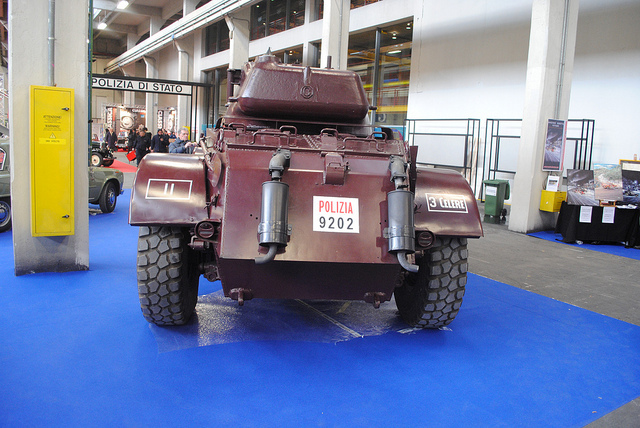 One of these vehicles has been restored and is visible in the Reparto Storico Polizia di Stato, Autocentro di Torino, Turin (Italy). Quality is very high, with every piece cast separately in a sturdy, yet well workable, resin. Engineering of the kit is exceptional, on par with the best plastic kits: no need to enlarge holes, cut pegs or bend pieces: everything goes where it should with no fuss. Being a quick-build kit, there are 20 pieces to assemble, so the building stage takes an hour or less: that is, if you want to build the kit OOTB, because converting it into the Italian version takes some extra work, although 5 pieces are not needed. To build the Police version, I worked mostly on piece 4 (the mantlet with gun and coaxial MG), cutting out the gun and the MG, leaving the empty hole in the mantlet where the MG was. Later, I cut out the barrels of two Breda 38 from Italeri M13/40 quick-build and glued them where the gun was. Then, time to work on piece 9 (frontal MG), cutting out the barrel and replacing it with a scratch-built barrel of a Breda 35. 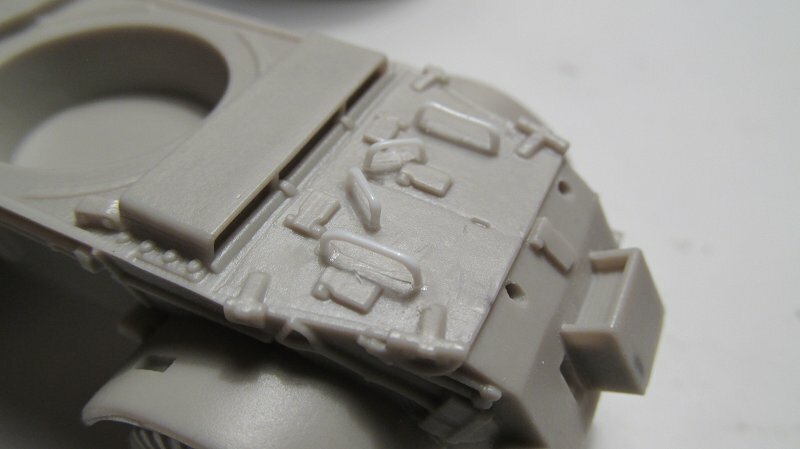 Then, I decided to replace the solid handles on the engine deck with scratch-built ones, because I think the model deserves it and the final result is well worth it. The Police version had no lateral bins and extra tanks (so I left out pieces 5 and 6, filling the holes in the lateral sides where the pieces were supposed to go) and no MG on turret roof (I closed the hole for pieces 11 and 12). Tools and towing cable are built-in, which is understandable considering the quick-build idea behind the kit, but their quality is obviously far from exceptional and they can not be removed without damaging the kit. I do not know if they were present in the Police version, but I had no choice than letting them stay where they are. Another detail that I left where it is the projector on turret roof (piece 13), which was not present in every Staghound and possibly absent in the Police version. 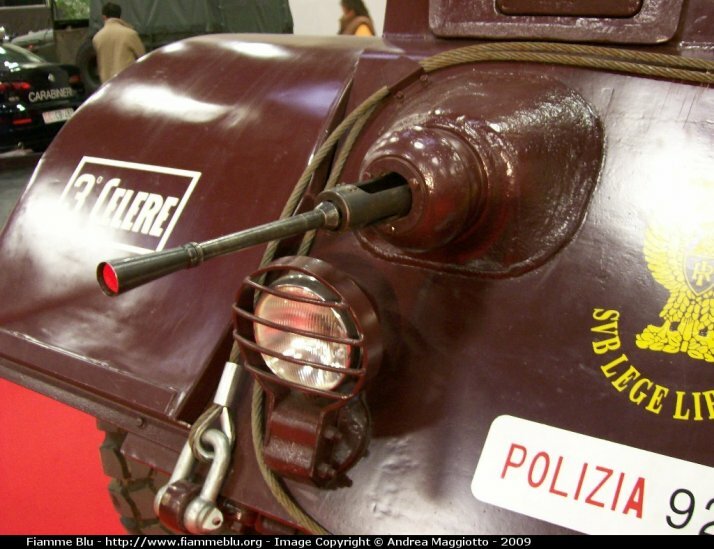 The typical maroon/amaranth color of Italian Police vehicles during the 40s and 50s is almost identical to Humbrol 20 Gloss Red, which is the one I used; another possible color is Games Workshop Mechrite Red. There are no decals for the Italian Police version among the ones supplied, but RPM provides some in their kit no. 72311 Staghound Mk II, which you can see reviewed here; Al Magnus was very kind to send me the decals I needed. The markings are those you can see in the profile on page 37 of Zaloga's book cited in References, exactly the restored vehicle visibile in Turin. 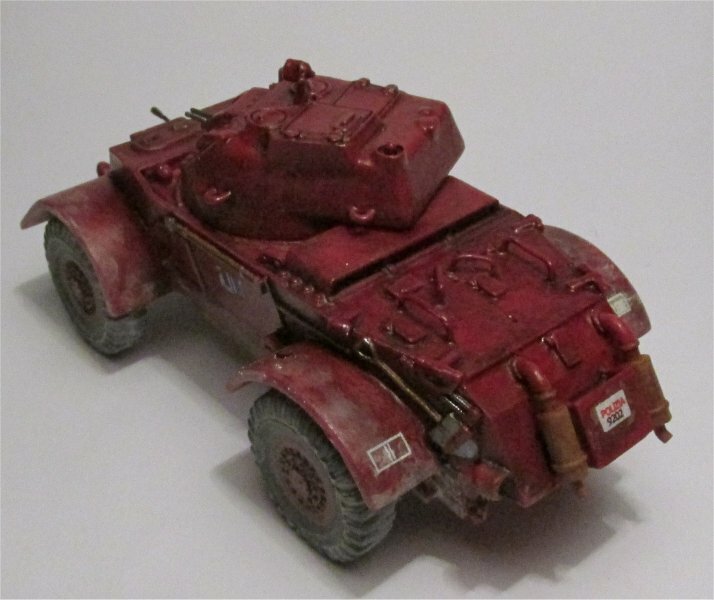 Vehicles were frequently shown on parades or kept inside barracks, which means they were rather clean: so, a semi-gloss finish with no weathering seems appropriate. Consequently, I just applied a black pin wash and a light coat of dirt on the wheels. In conclusion: A pleasant building experience which produced an accurate model of one of the most successful armored cars. Preview sample provided by the manufacturer. The author wishes to thank Al Magnus for having provided the decals.